She began DJ-ing in her hometown of Chicago in 2012, and has since lived and held residencies in New York, Los Angeles, and Manila, Philippines. In 2016, she accompanied rapper Chuck Inglish on a North American tour performing as his set DJ. 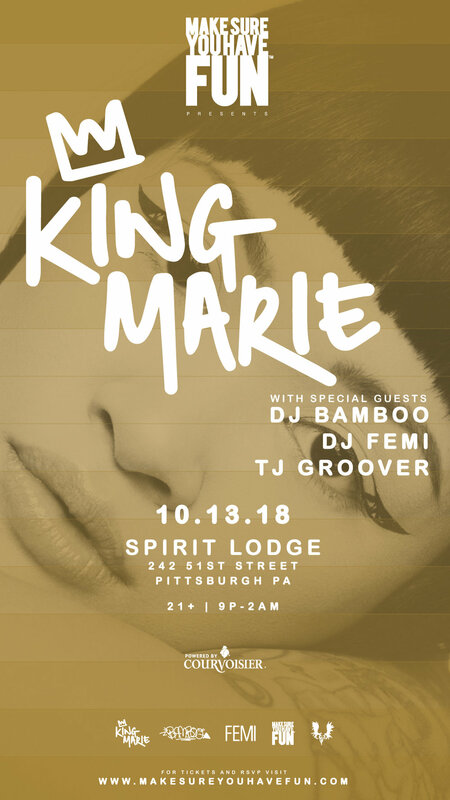 In 2017, DJ King Marie opened for singer Kehlani during Red Bull Sound Select's 30 Days in Chicago, engaging with a sold out crowd of 2,500. This same year, she also became the Chicago ambassador for DJ Jasmine Solano's women's empowerment campaign Unity in Color, curating both a women’s and men's photoshoot. In 2018, she opened for Major Lazer, played ASICS stage at Lollapalooza, headlined the Red Bull stage at Chicago’s Pride Fest, and played at Northcoast Music Festival this Fall. King Marie is creative director & resident DJ for Cold Chillen’, and throws her monthly party Kingdom at Blind Barber in Chicago. Her most recent independent projects include the Annual For Da Kids sneaker drive, 'This Is What Asian Looks Like' campaign, and Art for Social Justice Project. King Marie has also been featured as a model for a number of youth-facing companies, including Urban Outfitters, Nike, and Jordan. With over 10 years of DJing and music production under his belt, DJ Bamboo is a pioneer of the Pittsburgh music scene. He’s held down multiple weekly residencies at every major venue throughout the city and country. Bamboo’s passion for music shows in his style and sound, mixing things up playing a wide variety of genres to keep things interesting yet energetic on the dance floor.